The Wizards started 2019 off on the right foot with a 114-98 win over a frisky Atlanta Hawks squad on Wednesday night. Five Wizards players scored in double-figures led by Bradley Beal with 24 points and Jeff Green with 22. Thomas Bryant continued his outstanding play with 16 points and a career-high 15 rebounds and Tomas Satoransky was also terrific posting a near triple-double with 14 points, 11 rebounds, and seven assists. Washington controlled the first-half but the scoreboard showed otherwise. The Wizards opened the game shooting 57 percent in the first quarter but had trouble slowing down Atlanta as they only led by six, 35-29 after one quarter. Alex Len, the University of Maryland product, had an out of body performance this evening (24 points) playing just a few miles away from his alma mater. He came off the bench and had his way against the Wizards’ undersized bench and even hit a three to give Atlanta a spark. Len and John Collins combined for 28 first-half points to keep it from being an early rout. Washington took a comfortable but not too cozy, 11 point lead into halftime. Like we’ve seen in too many games this season, the Wizards had the Hawks at bay, but their offense went ice-cold for an extended stretch in the third quarter. With Washington leading 83-73, Atlanta cut into the lead with an 8-0 run and trimmed the deficit to four heading into the fourth quarter. 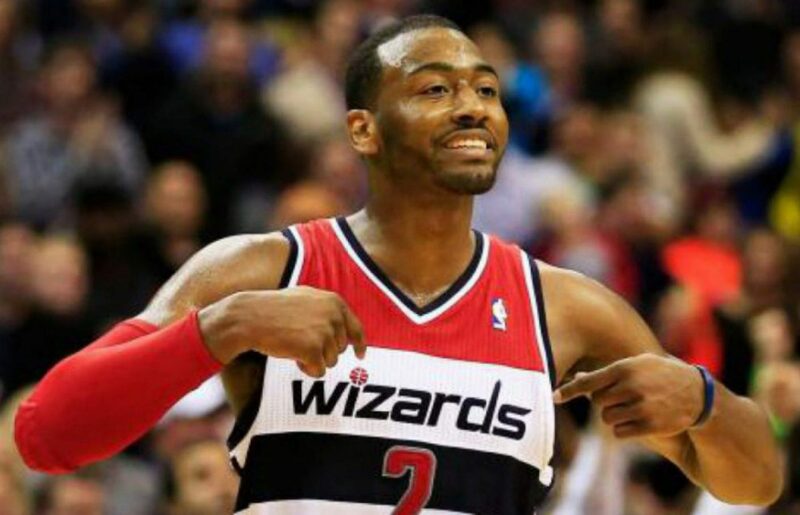 With the game tied at 94 and another #sowizards loss looming, Washington flipped the switch. The Wizards clamped down and forced Atlanta into one too many turnovers which created easy transition opportunities. Washington used the 17-2 run to pull away for a comfortable 114-98 victory. Alex Len put back a missed floater by Trae Young to tie the game at 94 with 6:44 left in the game and it looked like the Wizards were in store for another #SoWizards ending. But that’s when things took a drastic change in Washington’s favor. Bradley Beal, who was held to just 13 points prior to the fourth quarter, snaked his way into the lane for a tough layup. Next time down the floor, Satoransky found a trailing Beal for three quickly putting the Wizards up 99-94. Next time down, Bradley Beal drove baseline, kicked the ball to Satoransky who found Green in the corner for three to go on an 8-0 run in just 91 seconds. That sparked an extended 17-2 run in which Washington would take control of the game and never look back. Bryant continues to improve every single night. No, it wasn’t a historic performance like Bryant had a few weeks ago against the Suns where he went 14-of-14 from the field — but it was close. The second-year big man continued to impress this time to the tune of 16 points and a career-high 15 rebounds including going a perfect 5-of-5 in the first half and almost logging a double-double by halftime with 16 points and 9 rebounds. At first, Bryant was the beneficiary of the Wizards guards being able to penetrate the paint as that created easy opportunities for him close in. But then, all of his intangibles, which have earned him this extra playing time, were on display. First, it was doing the dirty work by setting hard screens, rolling hard to the basket, and crashing the offensive glass followed by him sprinting the floor for easy transition opportunities. Bryant’s production slowed down significantly in the second half but that still didn’t stop him from notching his third double-double of the season. Up Next: No time for an extended celebration as the Wizards have a brutal six-game stretch leading up to their trip to London later this month. It stars on in Miami on Friday night at 8 pm Eastern Time when they face the Heat, who have won seven of their last nine games. The Washington Wizards used a balanced attack led by Bradley Beal with 19 points to knock off the Indiana Pacers in a pivotal Eastern Conference matchup, 109-102. Marcin Gortat had one of his better games of the season with 18 points and eight rebounds and Kelly Oubre scored 16 points off the bench as the Wizards notch their 40th win of the season. Washington led by as many as 20 in this one, 101-81 in the fourth quarter and looked like they might win this one in a blowout fashion. But, Pacers coach, Nate McMillan pulled his starters with 5:33 remaining in the game, which sparked an Indiana run. Indiana used a 17-4 run behind the hot shooting from Lance Stephenson and TJ Leaf to trim the Wizards lead down to seven, 105-98 late in the fourth quarter. But Scott Brooks would reinsert his starters and the Wizards would hold suit knocking off the Pacers 109-102 and win the season series, 2-1. Five Washington players scored in double figures tonight and the team combined for 29 assists in the latest edition of ‘Everybody Eats’. After struggling for nearly the entire month of March, Gortat had a breakout game with 18 points, eight rebounds, and four assists. Kelly Oubre, who’s also struggled as of late, chipped in with 16 points off the bench including two timely three-pointers for Washington. Tomas Satoransky continued his outstanding play with 12 points, five rebounds, and eight assists as this time; he won the dual with Cory Joseph. The Washington bench combined for 37 points in another great all-around team effort for the Wizards. Last time these two teams played, Oladipo scorched the Wizards for 33 points in an Indiana victory. That was not the case tonight as the Wizards put the clamps on Oladipo holding him to a relatively pedestrian 18 points on 7-16 shooting from the field. Bradley Beal, who guarded Oladipo for most of the previous matchup started off defending the first-time All-Star tonight but the Wizards switched the guard positions much more freely. Tomas Satoransky also guarded Oladipo for stretches tonight and he was great at defending the dribble handoffs that the Pacers like to run. But most importantly for Washington tonight, they limited the Pacers, specifically Oladipo’s, transition opportunities evidenced as Indiana ended the night with just four fast-break points. Up Next: Washington heads to San Antonio on Wednesday night where they haven’t won since 1999. Bradley Beal led the Wizards with 34 points (including 29 after the first half) while Markieff Morris added 20 and Otto Porter chipped in with 18 as the Wizards executed down the stretch to overcome a rough start and beat the Celtics 125-124 in double overtime on Wednesday night. The Celtics, playing without Kyrie Irving, Al Horford, Jaylen Brown, and Marcus Smart looked like a real-life version of Hoosiers as they connected on 8 of their first 11 shots to put Washington in an early hole. The Wizards trailed by as much as 20 in the first half, but they went on a late run to cut the Celtics’ lead to seven, 59-52, at halftime. Beal, who was held to just five points in the first half, came roaring to life with 16 points in the third quarter to give the Wizards an 81-80 lead entering the fourth quarter. The Celtics jumped back ahead early in the fourth quarter, but Beal created his own shot several times down the stretch to keep Washington within striking range. Then, with just five seconds remaining and the Wizards down 106-103, Markieff Morris inbounded the ball to a cutting Otto Porter who found Jodie Meeks in the corner for three to tie the game at 106 at the end of regulation. The Wizards had a chance to ice the game in overtime with a two-point lead, possession of the ball, and just eight seconds to play – but Markieff Morris struggled to get the ball in which led to a turnover. Then, Jayson Tatum made a layup through contact on the ensuing possession to tie the game at 115. Tatum then returned the favor and let the Wizards off the hook, missing a go-ahead free throw with three seconds left which gave Washington a second chance in double overtime. With the Wizards up 122-119 in the second overtime period, Bradley Beal drove baseline only to get double-teamed in no man’s land. Somehow, he found Tomas Satoransky who kicked it to Markieff Morris for a wide open three to put the Wizards up by six. The Celtics were able to claw back within one, 125-124 and had an opportunity to take the lead on the final possession, but Tatum’s shot clanked off the back rim as Washington escaped with a much-needed win on the road. There’s been plenty of chatter lately about Washington’s woes in the clutch, especially on the offensive end late in games. Were the Wizards perfect down the stretch? No. However, they looked a lot more composed and executed as well as you could have asked for in such a tight game. Let’s break it down by period, shall we? Fourth Quarter – After Marcus Morris knocked down a corner three-pointer which looked to bury the Wizards, Bradley Beal, the main guy who’s received this criticism remained calm and took Aron Baynes off the dribble for an easy layup to cut the lead to two. The next time down, again, he did his dance and took his man off the dribble for another layup close in to trim the lead to one. With just five seconds remaining, Scott Brooks drew up an outstanding play in which both Beal and Porter curled off screens hoping to get either of them open for a three-pointer. Porter was not open for three but continued his cut through the lane to find Jodie Meeks in the corner for a wide-open three and he buried it. Overtime – In the first overtime period, the ball continued to swing as Sato found Porter in the corner for three to open up the overtime period. Satoransky, who was a bit passive with his shot at times in the game, ran a perfectly executed pick-and-roll with Morris only to get fouled and knock down both free throws. Double Overtime – Beal, who was so tired he could hardly cross half court, stayed in attack mode as he was able to draw a foul and get to the line to start the second overtime. Midway through the period, he took Baynes off the dribble yet again to finish with this nifty reverse layup and the foul to stretch Washington’s lead out to six, 125-119. Bad habits are turning into problems for the Wizards. Washington committed 20 turnovers resulting in 25 Boston points. But on the bright side, they only allowed 56 points in the paint! Next up: The Wizards are off until Saturday when they host the Pacers at 7 p.m. ET. Bradley Beal scored 30 points on 12-of-16 shooting and Tomas Satoransky had a bounce-back game with 19 points and seven assists as the Wizards escaped with a 117-113 overtime victory against the Heat on Tuesday night. Washington raced out to a 27-9 lead and looked like they might bury a tired Miami team playing on the second half of a back-to-back, but it wouldn’t be as simple for the rest of the game. The Heat’s bench, led by Dwayne Wade, tied the game back up at 39-39 early in the second quarter and it was a tight affair the rest of the way. Bradley Beal, who’s shouldered the load since Wall has been out, scored the Wizards’ last seven points in regulation, but also had two costly turnovers in the final four minutes and missed a jumper at the buzzer that would have won the game. Washington took a four-point lead with 22 seconds left in overtime, but nearly gave it away with some sloppy execution on both ends. First, Kelly Oubre fouled Dwyane Wade on a 3-point attempt which allowed the Heat to cut it to a one-point game. Then, after the refs missed a five-second call on the Wizards’ inbound pass, Satoransky split a pair of free throws to put the Wizards up 2 with 10 seconds left. Dwayne Wade posted on up Satoransky and got a clean look in the paint, but was unable to bury the floater in the lane to tie the game. It wasn’t pretty, but Washington snuck out with just their second overtime win of the season and snapped their three-game losing streak. Washington was inept on both ends of the floor down the stretch in both the fourth quarter and overtime periods. Markieff Morris and Tomas Satoransky both missed free throws in the final minute of play in regulation which kept Miami’s hopes alive. Then, with the game tied at 105 and just seconds to play, Bradley Beal pounded the ball into the floor and settled for a step-back jumper at the buzzer that fell way short. Washington also made some defensive blunders that complicated things late in regulation. With under a 30 seconds left in the fourth quarter, Markieff Morris tried to close hard on Dwyane Wade at the 3-point line, which let Wade build up a full head of steam and power through Beal to get the and-one opportunity at the rim that tied the game. Washington’s execution on both ends of the floor down the stretch in the fourth quarter and overtime periods was substandard and they’re lucky to sneak away with the victory. It was looking like Bradley Beal might get an easy night, but Washington’s late struggles led to Beal playing over 40 minutes for the second game in a row. He was outstanding in this game, scoring a game-high 30 points on 12-of-16 shooting to go along with seven assists. He was on fire from everywhere, especially from three-point range where he connected on his first five attempts from deep and ended the night 6-of-7 from distance. Another BIG night from @RealDealBeal23. Morris, the unsung hero of the Wizards’ success during this stretch without John Wall had another nice game tonight with 16 points (10 in the first half) and 13 rebounds. But more importantly, Keef was very active this evening on the defensive glass as he was grabbing all loose balls in sight and jumping to tip balls away from Miami players when he wasn’t in position to grab the rebound. He was also outstanding when moving without the basketball tonight. On a run near the end of the second quarter where the Wizards were looking to build out their lead again, Morris found Beal who gave the ball right back to Morris on a picture-perfect give-and-go for an easy dunk. Morris’ midrange jumper was falling tonight as well and he was getting wide-open looks making it that much easier for him to connect. Whether it’s Morris and Sato, Morris and Beal, or really, any of the Washington guards; Morris’ bread and butter over the past few weeks has been slipping the screen for a jumper or rolling hard to the baseline on a pick-and-roll resulting in wide open jumpers in the midrange. No shot was bigger tonight than when Beal found Morris in the corner for three with just 1:06 to play and he buried it to put the Wizards up by four. Ramon Sessions got some run tonight in his second go-round with the Wizards and made the most of it with six points including going 4-4 from the charity stripe. At the same time, he was a -17 in under 13 minutes against Miami’s deep bench. Otto Porter (12 points) left the game midway through the fourth quarter after colliding with Dwayne Wade for a loose ball, bruising his hip. He’s listed as day-to-day. Next up: The Wizards hit the road to face Anthony Davis and the New Orleans Pelicans at 8 p.m. on Friday. With less than one minute to play and the shot clock winding down, Bradley Beal drove by his man slicing through the lane for the layup as the Wizards hang on to beat the Cavaliers, 110-103. Beal led the way for Washington with 18 points and Tomas Satoransky wasn’t far behind with 17 points and eight assists as Washington wins their first game after the All-Star break and is 10 games above .500 (34-24) for the first time this season. Kelly Oubre, who’s struggled with his shot over the past month, looked like he may have broken out of his slump as the third year player also chipped in with 17 points and knocked down 3-6 three-point shots. This was the first home game since the new look Cavs overhauled their roster but it was the Wizards who would have the last laugh. The Wizards used a 16-4 run to stretch their lead to 11 midway through the fourth quarter. But the one-man wrecking ball of LeBron James wouldn’t go down easy as he nearly willed the Cavs to victory scoring all Cleveland points after the 9:00 minute mark of the fourth quarter as James and the Cavs trimmed the Wizards lead to 3, 104-101 with two minutes to play. With just seconds remaining on the shot clock and under one minute to play, Coach Scott Brooks ran a brilliant after the timeout play where Otto Porter inbounded it to Beal who passed it right back to Porter for a reverse layup and a five-point Wizards lead. After LeBron barreled his way for an easy bucket, Bradley Beal sliced through the lane for a layup to stretch the Wizards lead to five and keep Cleveland at bay. Satoransky knocked down two free throws late to ice the game as the Wizards come up big late and sneak out of Cleveland with a 110-103 victory. It looked like things might get ugly for the Wizards in the first quarter. The Cavs were on fire knocking down 61 percent of their shots in the first period and LeBron James looked well on his way to a triple-double with seven points, six assists, and five rebounds through one quarter. However, the Wizards were able to flip the script starting in the second quarter. The Wizards used an 11-1 run in the second quarter to get back in this one highlighted by back to back three-pointers from Bradley Beal and Kelly Oubre to trim Cleveland’s lead to two. Oubre, who has been in a funk for the past month, scored 12 points in the second quarter as the Wizards were able to climb back in this one and regain the lead, 57-54 at halftime. What more is there to say? Tomas Satoransky continued to impress tonight his time to the tune of 17 points on 6-7 shooting to go along with eight assists. Early in the first quarter as the Cavs were building their lead, Satoransky chipped in with timely buckets to keep the deficit within reach. He started the second half connecting on a three-pointer to give the Wizards a five points lead and hit a tough fadeaway jumper at the end of the period as the Wizards led by just 3, 82-79. Sato pitched a near-perfect game tonight; and the cherry on top? He didn’t commit a single turnover in 31 minutes of play. Up Next: Washington heads home to play the Charlotte Hornets tomorrow evening. Tomas Satoransky turned in a career night with 25 points on 10-12 shooting to go along with six assists as the Wizards beat the Chicago Bulls, 101-90 on Saturday night. Otto Porter added 14 points and Mike Scott chipped in with 14 off the bench as the Wizards avoided their first three-game losing skid of the season. Chicago took a 2-0 lead on a Robin Lopez jumper to start the game. It was the only time the Wizards trailed all game as they were able to maintain a double-digit lead the rest of the way for most of the evening. Washington won the war of attrition as Tomas Satoransky, Tim Frazier, and Ian Mahinmi were forced to leave the contest early for varying reasons and Markieff Morris didn’t dress due to flu-like symptoms, but regardless, the Wizards still found a way to get the win on the road. Tomas Satoransky scored a career-high with 25 points tonight on a blistering hot 10-12 shooting including knocking down five-of-six of his three-point attempts to go along with six assists. He set the tone early for the Wizards as he was constantly looking to push the ball and get out in transition. As a result, the Wizards had three uncontested dunks or layups in the first quarter. He got going early by making all three three-point attempts in the first half as Washington built a double-digit lead. When the ball wasn’t in his hands on offense, he kept himself involved with timely cuts through the paint. Tomas Satoransky with a play in the post and then a fastbreak slam on the next play. He's got 15 points already! Sato continued his hot shooting in the second half as he added another 10 points including this three-pointer to give him a new career high in points and three-pointers made. The Wizards came into this contest averaging just 26.5 three-point attempts per contest, but they came out gunning from three-point range in the first quarter where they took 13 shots from deep and connected on six of them. Washington had a cold stretch from distance through the second quarter and into the third quarter but it was key three-pointers from Tomas Satoransky, Jodie Meeks, and Mike Scott in the fourth quarter as the Wizards were able to halt any run whenever it looked like Chicago might get back in this one. At the 2:35 mark of the fourth quarter, Tomas Satoransky drove baseline for a dunk and Bobby Portis fouled him up high resulting in a very scary fall for Satoransky. Sato looked to have a gash on the side of his head and didn’t return putting a damper on a career night. Earlier in the game, Tim Frazier hit his head on Bobby Portis’ knee when diving for a loose ball. He left the game with a nasal fracture. If either player has to miss time, don’t be surprised to see the Wizards grab a point guard to provide more depth. Markieff Morris missed tonight’s game due to flu-like symptoms and it looks like it might be spreading around as Ian Mahinmi played in the first half but didn’t return in the second half due to illness. As a result, Jason Smith and Chris McCullough received some unexpected playing time. Bradley Beal had a second straight cold shooting night as he was held to just seven points on 3-13 shooting and missed all seven of his 3-point attempts. The Washington bench combined for 38 points led by Mike Scott with 14 and Jodie Meeks with 10. Everyone was eating yet again as the Wizards combined for 31 assists. Next up: The Wizards play their final game before the All-Star break in New York on Wednesday against the Knicks at 7 p.m.